Craft of choice: If I had to pick just one, it would be sewing! * Who are you and what do you do? By day – I’m a Primary School Teacher. In my spare time, I love doing Yoga and all things crafty (baking, sewing, knitting, cross stitch, appliqué etc.). I am also the owner of the ‘Love Lorna’ blog which shares all the crafty bits I’ve made and shows you how to do them too! I love making things for people – birthday cakes, baby gifts, birthday presents, Christmas presents etc. I am always keen to find new crafts and give them a go. * How did you get into craft? When I was about 10 years old, my friends Gran taught me how to knit. I knitted the odd scarf through the years, but in last few years I have tried out many new crafts and really found my love of all things crafty (with the help of Kirstie Allsopp). I found that making things for people gives you a warm fuzzy feeling inside that makes you feel really good. I set up my craft blog in August 2011 as I wanted to share with the world the crafts I was making and to help other people make them too! * Why did you decide to get involved in the Jigsaw project? When I received an email from CraftblogUK asking bloggers to get involved with this important campaign, I was so excited at the thought that I could help people across the other side of the world by doing something I loved. It made a nice change from making things for people as presents, and it looked so easy that I decided to give it a go. I love how open the project is and how everyone can put their own personal touch on their piece by decorating and designing it how they want. * What have you stitched on your piece and why? The colours used on my puzzle piece reflect my personality and the gentle way in which we are protesting. I cross stitched on a quote from Gandhi, ‘In a gentle way we can shake the world’, as I felt that it reflected what the campaign is about and what it is trying to achieve – changing the world and the way people look at it, through craft. 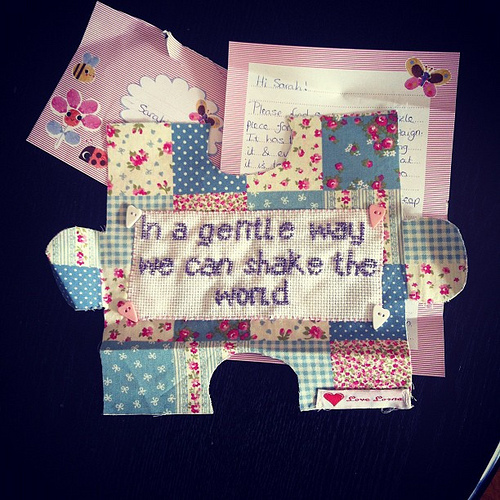 * What do you love about Craftivism? I love how you can be so in touch with the worlds needs and help to try and solve global issues through something so many people love – making things. People see the time and effort you have taken to make these crafts that it shows you are really serious about the issue. Not only do the campaigns make a difference to those in need, but they also build confidence and relationships within those who are getting crafty – plus they are so much fun! Anyone who wants to make a difference and have fun and feel good all at the same time should definitely get involved. We hope you feel inspired. If you’d like to get involved with our #imapiece project, everything you need is here, including instructions, jigsaw template and tutorial video.